The Asian American Election Eve Poll, a pioneering partnership between the AAPI Civic Engagement Fund and Asian American Decisions, interviewed 1,150 Asian Americans between Oct. 30th and Nov. 4th in a multi-ethnic, multi-lingual, nationally representative survey with targeted samples of Asian Americans in California, Texas, and Virginia. 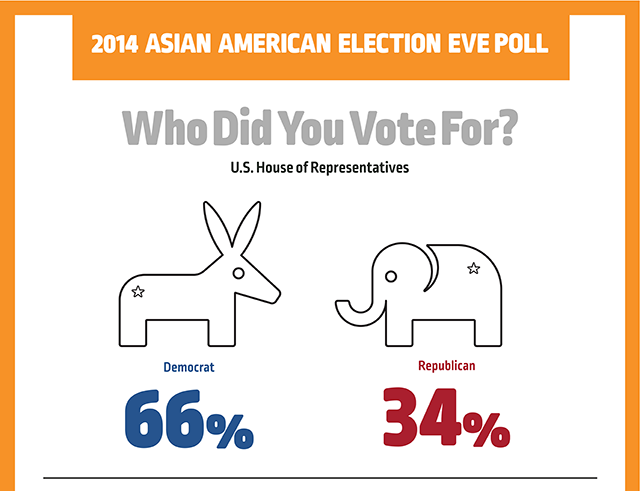 In the 2014 Congressional elections, Asian Americans supported Democratic candidates 2 to 1. Issues most important to Asian American voters include: the economy, education, health care, and immigration.